Historical detail comes alive as debut author Linda Buckley-Archer weaves the eighteenth-century trials of Gideon, Kate, and Peter with the modern-day worries of their parents and the wily investigator trying to piece together the children's disappearance. 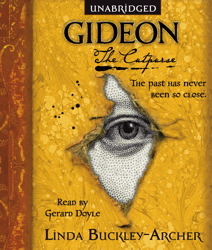 A time-travel tale in the tradition of Mark Twain with a touch of Back to the Future, the first audiobook of the Gideon trilogy introduces listeners to a modern genre all its own. Is a good book but is really long but still is really good. But it can bee very sad???? i am 7-years-old. Thank you for lisinean it really is a good book??????????????? ?